A “Barefoot Abbey” and the Brilliant Spanish Composer Thomas Luis de Victoria. Music at Messiah’s Classical Concert next concert will be Saturday evening, November 1st starting at 7:30 pm. 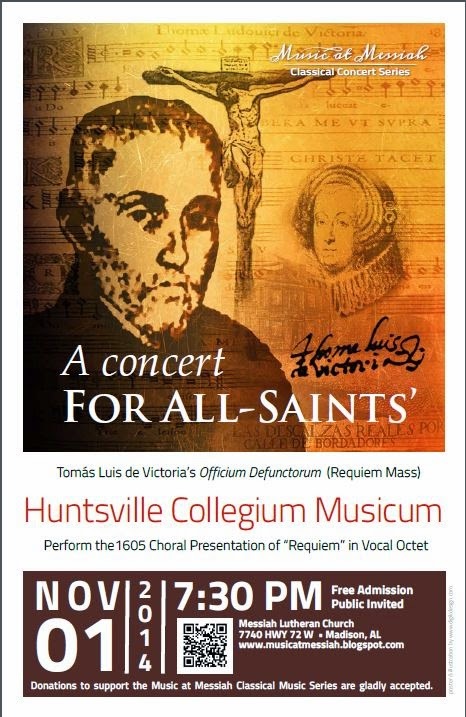 It will feature Huntsville Collegium Musicum’s performance of Thomas Luis de Victoria’s Officium Defunctorm. Researching Victoria’s “Requiem” for relevant visuals for the poster and program artwork was an interesting journey. The spanish composer was born in 1548, and evidence suggests he grew up a choir boy in the Cathedral in Avila. The Catholic Counter- Reformation that nearly paralled his years provide a historical backdrop for this young Catholic man with outstanding musical gifts. So promising were his talents that Philip II provided him a grant to travel to Italy in 1567. Victoria lived in Italy for the next twenty years; he canted, attended seminary, taught at the German College and was very well respected, holding a number of succeedingly impressive posts as a chapelmaster and organist. By 1587 Victoria desired to return to Spain, and once again, Philip II responded, posting him to be the personal Chaplain of the Dowager Empress Maria. The music itself is a funeral mass written for Empress María’s death in 1603. She lived in retirement with her daughter Princess Margarita at the royal monestary The Monasterio de las Descalzas Reales, literally the “Monastery of Barefoot Royals.” Upon entry to the convent, these well heeled women would donate their dowry to the convent and vow to go shoeless. (Could it be expensive women’s shoes have always been horribly uncomfortable?) The convent was tremendously well off and the Monastery allowed Victoria to produce gloriously rich and spiritual compositions until his death in 1611. The Counter Reformation fueled a revived spritualism in Catholic religious arts, and this is also evidenced by Victoria’s contemporary, El Greco, whose Crucificion also appears on the poster artwork. The intensity and palette of tones are emotional, and one cannot listen to Victoria’s Requiem without feeling that same sense of spiritual awakening that is ever present in El Greco’s work. If you are intrigued by this, you’ll really enjoy this Sacred Music program on Victoria produced recently by BBC on Victoria’s music, featuring the choral group “The Sixteen.” It’s lengthy, but well worth an extended listening. I hope this article, as well as the video pique your curiousity and compel you to attend the November 1st presentation of Victoria’s Officium Defunctorium.